Michael J. North spoke today at the National Library of Medicine in recognition of Hispanic Heritage Month on “Early Latin American Medicine in the NLM Collections.” Mr. North is Head of Rare Books and Early Manuscripts in the History of Medicine Division of the National Library of Medicine. Circulating Now interviewed him about his work. MN: A love of languages, as well as the history of medicine, brought me into the world of rare books. I was a Greek major as an undergraduate and a Latin minor, and I also read French, Spanish, Portuguese, and Italian. I moved to Washington, DC, after college and got a job at Georgetown University Library’s Special Collections, in large part because the University was founded by Jesuits, so a lot of its older materials were in Latin. While working there, I got a Master’s degree in Theoretical Linguistics, which is basically grammar and phonology, two of my favorite things about Greek and Latin. In Library School at the Catholic University of America, I was able to focus on the book arts, or rare books, which had long been my main interest over archives and other special collections formats. As the Head of Rare Books and Early Manuscripts at the Library, I am essentially the curator of this enormous and varied collection of materials from all over the world and spanning almost ten centuries. I lead a staff with expertise in cataloging rare books, conservation, and providing reference services to users both onsite and offsite. During a typical week we may deal with issues ranging from describing a unique medieval manuscript on veterinary medicine, to answering a query from Japan about a 17th-century book on acupuncture, to adjusting the humidity in a collection area and repairing a damaged binding. We are also in the midst of digitizing a great deal of the collection, with a special focus now on early American books, including our oldest Latin American titles. CN: In your lecture today on “Early Latin American Medicine in the NLM Collections” you provided an overview of NLM’s book holdings of Latin American titles from 1607 to the present. Give us a sense of the scope of the collection. 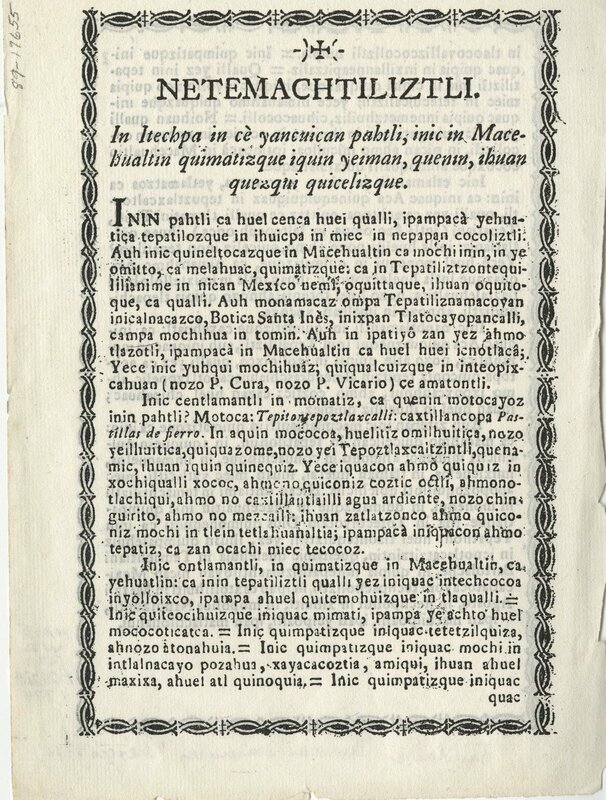 printed in Mexico City, circa 1774. MN: The National Library of Medicine has been in business for over 175 years, and for most of that we have been collecting not only books about health and medicine from the United States, but also books from all over the world. This has included thousands of books relating to or published in Latin America. Beginning in the 1850s, this material was often collected as it was published, so it came to the Library new. Later in the 19th century, however, the Library began to purchase historical texts because administrators like John Shaw Billings knew that modern medicine had to be put into context with its history in order to get a complete picture. The majority of our Latin American books come from Mexico, the primary center of Latin American medicine through much of the past three hundred years, and where, in 1570, the first medical book in the New World was published. Other centers of publishing have been Peru, Brazil, and Argentina, but we have early materials from nearly everywhere, including what is now Haiti. Topics range widely from formal academic medicine to treatises on childbirth, smallpox vaccination, and yellow fever epidemics. CN: What were some of the issues that had an impact on medical publishing in early Latin America? MN: One of the major issues affecting medical publishing in Latin America, especially during the early period in the 16th and 17th centuries, was the heavy control of the printing press by the Catholic Church and the colonial governments, so that most publishing taking place was related to religion or governance for the first 100 years. Also during this time, nearly all supplies relating to printing had to be imported from Europe, including paper. So printing was often both heavily censored and expensive. 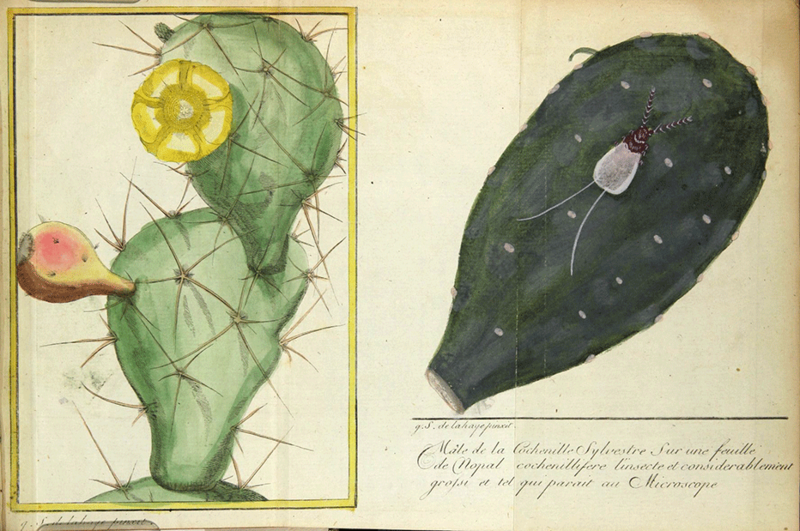 Other contemporary issues include the exploration and cataloging of native plant species for their economic and medical uses, as well as topics that appeared all over the New World in the 19th century such as the introduction of smallpox vaccination and translations of French and German medical texts into local languages. CN: Tell us about some of the authors of these books, what are their stories? MN: Agustín Farfan was a physician who had come to Mexico from Spain and subsequently became an Augustinian monk and missionary. Farfan’s Tratado Breve de Medicina y de Todas las Enfermedades, or Brief Treatise on Medicine and all Illnesses, was very popular and came out in three editions beginning in 1579. NLM has a copy of the third edition of the book, printed in 1610. It includes chapters on many common ailments such as fevers and dysentery. There is also a chapter on smallpox, which he notes as an extremely deadly disease that had been causing the deaths of thousands of native Mexicans in the decades before his book was published; he believed smallpox was caused by corrupted blood and advised bloodletting as a treatment. Title page featuring a woodcut portrait of St. Augustine, from Agustín Farfan’s Tratado Breve de Medicina y de Todas las Enfermedades, Mexico City, 1610. Woodcut initial from Agustín Farfan’s Tratado Breve de Medicina y de Todas las Enfermedades, Mexico City, 1610. Another interesting personality is Benita Paulina Cadeau de Fessel, called “Madama.” She was a professionally trained midwife from Paris who immigrated to New Orleans, Mexico, and finally ended up in Lima in about 1820, where she founded and headed up La Maternidad, a school of midwifery. We have four items by her, mainly manuals of midwifery, and they have some interesting but somewhat crude copperplate engravings for illustrations. The item below on the right is from a case report by Madama concerning a woman with an extra-uterine pregnancy. I believe that these are the oldest items we have from Latin America that were authored by a woman. Engraved illustration from a midwifery manual, by Benita Paulina Cadeau de Fessel, called “Madama,” Practica de Partos, Lima, 1830. Noticia de una fecundidad extraordinaria y relación histórica de una preñez extra-uterina, Lima, 1820. CN: The collections in your care are used by scholars and researchers every day, how would you encourage the public to explore the collection? MN: A majority of our Latin American books dating up to about 1880 have been digitized and are available free through NLM’s Digital Collections online archive. An easy way to access many of these Latin American materials is to sort the materials by clicking on “Languages” in the box on the lower left labeled “Refine By.” There you can select a group of over 300 items in Portuguese or over 260 items in Spanish. The Library continues to scan materials from Latin America in these languages and adds to the Digital Collection daily. You can also contact the History of Medicine Division Reference Desk at NLM Customer Support. 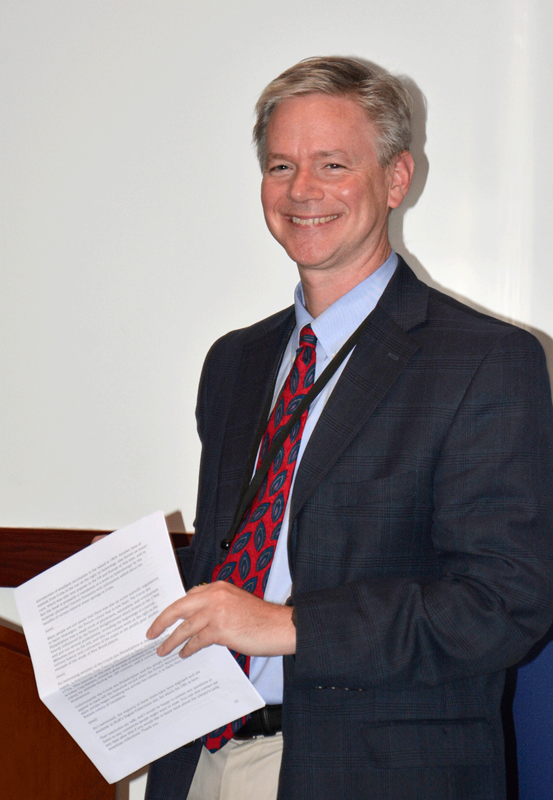 Michael J. North’s presentation was part of our ongoing history of medicine lecture series, which promotes awareness and use of NLM and other historical collections for research, education, and public service in biomedicine, the social sciences, and the humanities. The most famous Latin American medicinal of plant origin is of course that which is found in the bark of the cinchona tree. This is quinine which has saved thousands because of malaria. It is seldom used nowadays because of potent synthetic substitutes and the fact that it can cause heart arrythmias, similar to quinidine. Thank you for the comment. Yes, the bark of the cinhona tree was a great boon in the treatment of malaria; originally used by Native Americans in the Andean tropics as a muscle relaxant, European physicians discovered its use for malaria in the 17th century. You can see some early texts about the plant in NLM’s Digital Collections site by performing a keyword searches on “cinchona” and “bark”: http://collections.nlm.nih.gov.